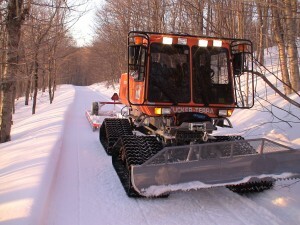 Currently the author of this blog is Roy Arthur, Vice-President, Trail Coordinator and one of the Tucker Sno-Cat operators. From his ideal perspective, Roy will be posting trail condition reports and anything newsworthy. We would be happy to have more blog authors if other members would like to join the blog in writing about such topics as news and announcements, photos or trail reports from a riding perspective. If interested please contact us. Blog entries are always listed chronologically with the most recent at the top. Comments are listed chronologically with the oldest comment listed first. Use Blog Categories to filter blog entries by a topic or select All Categories to browse. Quick links to Recent Entries and Recent Comments are in the right column where there is also an Archives dropdown list that helps you find entries by date. If you plan to use the trails we suggest you subscribe to our Entries RSS Feed so you will be notified of new blog entries which primarily keep you informed of the latest trail conditions before you head for the trails. The Comments Feed are for those who get involved in discussions using the comments. Commenters should subscribe to the Comments Feed so they will know when someone replies to their comment. For those more comfortable with email notifications, now you can subscribe via email to posts by entering your email address in the Subscribe Via Email field in the sidebar. Also in the comment area you can choose to be notified of replies by email. You’ll need to supply us with your email but it is only used for this purpose. We won’t bug you with emails you didn’t ask for and we don’t let your email out to anyone. We despise spam too! Either way you subscribe, posts or comments, you will receive a confirmation email asking you to confirm. This way someone else who knows your email address can’t sign you without your consent. Comments are open for your use and are intended for discussion of points raised in specific blog posts. Find them at the end of each post. Your first comment is moderated so expect a delay before it displays. This is not to check what you are saying but more to keep spam comments out. After your first comment, successive comments will display automatically. Keep in mind, Blogs are public so please do not use the blog for private questions or comments. Send these to us via email. We hope you find our blog useful and would appreciate any feed back you have on any topic via our email form. As a WordPress blog, there are many features available to us so if you see the need for a feature or function the site currently lacks, let us know and we’ll see if it is available.